Food and water have already been added to the list of necessary items, long ago. Toilet paper is another one that was added after the March 11 earthquake. The main reason is that 41 % of Japan’s toilet paper industry is located in an earthquake prone area. A month after an earthquake hits, the rest of the factories around the country should be able to produce enough toilet paper supplies. 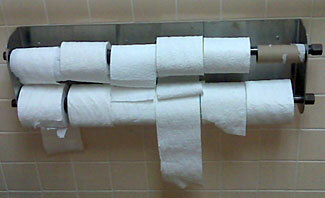 Thus a month of toilet paper supply is suggested. Most households stock up on bottled water, food, wet tissue, candles, etc.